The one-board quiver is here! You are the kind of paddler that enjoys a flat-water day but still wants to hit up the ocean and stroke into a few fun waves. Pioneered by Imagine Surf, the Crossover was inspired by the idea that one board truly can do-it-all. Many attempts have been made by others to recreate its versatility and fall short of the unique shaping features and volume that separate this board from all others. Year after year the Crossover proves its popularity and remains our best selling board. The Epoxy Crossover Wood Composite features a clean sweeping V-Bow that cuts effortlessly through the water, before running into a subtle concave center section and shallow V-tail. 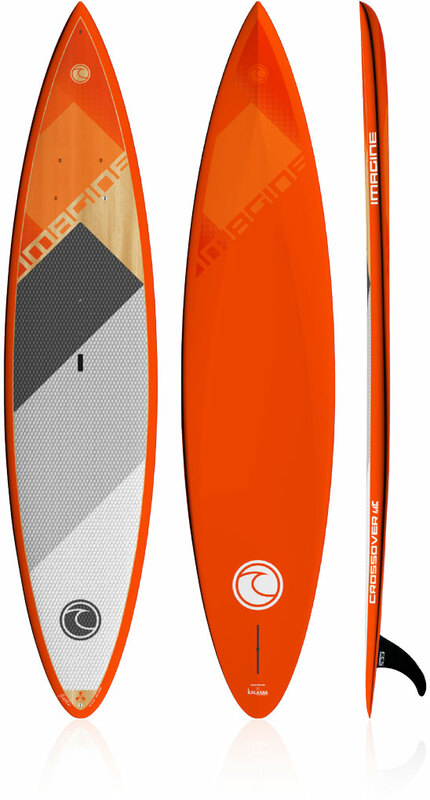 Sounds complicated but it translates to the perfect compromise of flat water paddling efficiency combined with surf inspired capability. Durable and lightweight, the artfull look of traditional hand-built softwood surfboards meet the cutting edge construction techniques of today’s surfboard industry. The Wood Composite range combines the aesthetic beauty of natural wood layers with the lightweight durability of reinforcing glass layers. Piece of mind knowing you have the best there is. The Connector is designed by Dave Kalama who is the pioneer of SUP downwind paddling. Dave has been designing and testing downwind boards and winning downwind races since the beginning of modern day SUP as we know it. What makes downwind paddling fun and rewarding is the glide you get when you hook up a bump and are able to connect from one bump to another and string together a long ride with tons of glide. To do this you need a board that gets you on the bumps, and allows you to stay on the bumps. The Connector’s progressive nose rocker, parallel touring style outline and ample width allows you to take on and have fun in all water and weather conditions. Take it on your regular downwind run or use it to explore the coastline. Whether it’s for an afternoon cruise, multi-day expedition, or to connect the bumps to see how far they take you, the Connector is confidence inspiring performance in every detail. You also need a board that accelerates fast and is stable enough to handle the chop that downwind conditions throw at you. The Connector is a combination of all of these design needs rolled up into a clever board to allow you to have as much fun as possible during a downwind run. Keeps you close to the waterline promoting stability and glide. The Epoxy Mission Glass Composite boasts all of the shaping and design features of the Wood Composite model in a slightly more durable construction. The displacement hull and plum bow combined with ample width and flat standing area makes for one fast and stable board. 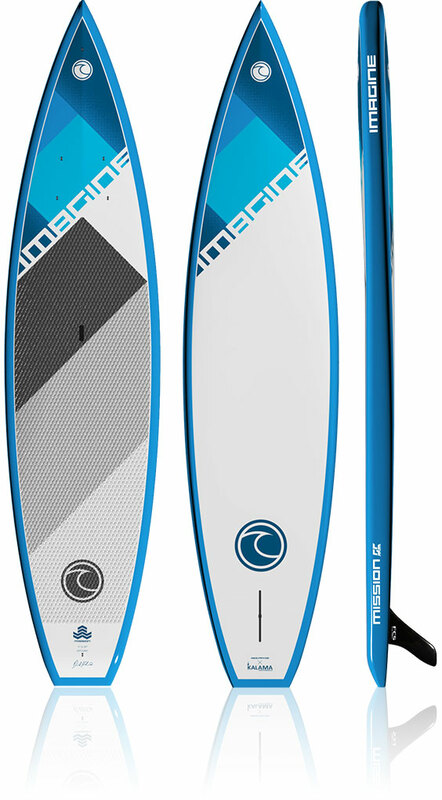 Molded Glass Composite technology harnesses the strength and durabilty of fiberglass layers surrounding a lightweight EPS core to produce performance paddleboard shapes that can do it all.